The last week or so has proven to be one giant test for me personally and while I don’t feel compelled to go into details I will say that having an outlet such as blogging has been something of a godsend because it’s helped me from falling over the edge into places that I don’t really want to go. Frankly, if I did I might not ever return from them. One thing that I have learned is that we don’t know what’s around the corner; there are no absolutes. People come into our lives and for whatever reason sometimes they don’t stay there and there may not be a clear cut view of why or how…it just happens. It has brought me to the thought that while time is infinite regardless of where we are within it and how long we have, it is our enemy. We can carry our weapons silently ready to fight it when it comes and each battle leaves you scarred on the inside until finally time rallies and strikes that one final blow….that’s the cycle and that’s what we have to contend with every day and most days we don’t allow our conscience to dwell or think about it. The idea for this post has been in the making for months and I’ve had it in my head for longer than I can recall but all the pieces were not quite there yet until I came across a unique pose from SamPoses at Pose Fair. 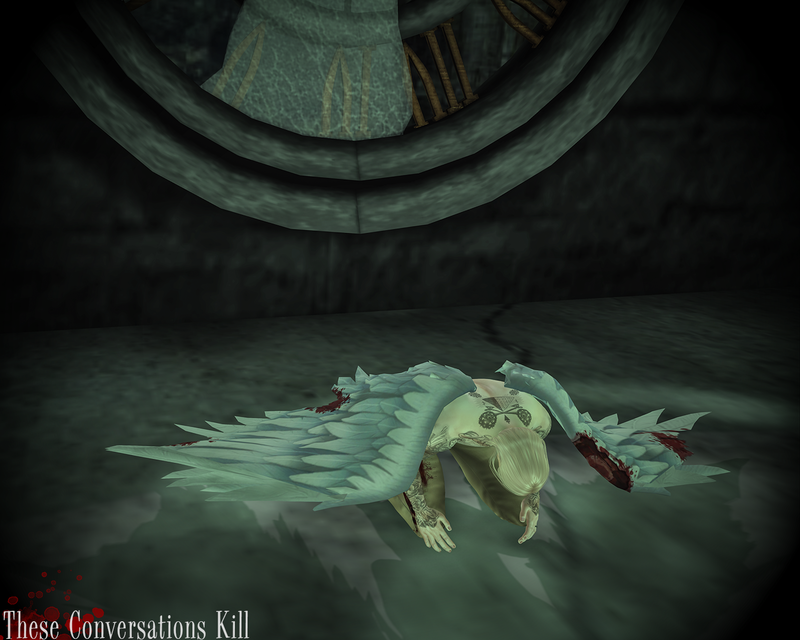 “The Fallen Angel” is exactly as it says it is with a kneeling battered wings with missing feathers and a bit of blood. It was the last piece I needed to finally filter this idea from out of my head. At the beginning I had purchased the Distorted Dreams “Lost Time” skybox and wanted so badly to do something with it but I just couldn’t come up with anything and so I kept it in my inventory in plain sight that I could use it the moment I had something to go with it. I love the apocalyptic broken clock tower vibe that it gives off; it also plays into what I’ve said just a few paragraphs ago as well. 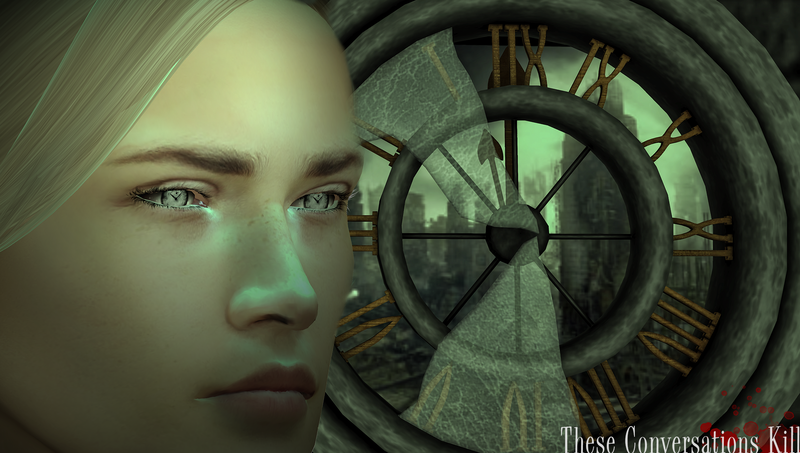 Go& See released a set of eyes around Halloween last year that I’ve been itching to use as well because of the skybox, one of the eyes in the pack is a clock and thought it was a great addition to the whole atmosphere of what I had in my head visually. All of the eyes that are from Go&See are for CATWA branded eyes and will only work with them, which if you do not have a pair with a head or standalone you are missing out. My good friend (and sister from another Mister) Lee Valentine of the LV Designs brand released a new skin at The Darkness event (if you recall in the previous post, “Shin” is also from the same brand so I am piggybacking yeah!) It is called “Angel” and comes in two tones both of which are compatible with Stray Dog tones 01 and 02 and there are two different HUDs for each tone. Not only is there a regular version of the face (with and without brows) but also a “Fallen” version with goth type lipstick and guyliner. As much as I wanted to use the “Fallen” version in this blog entry it just did not work with the theme overall but I really think it was a great idea and concept so I’m going to give extra points to Lee for using some out of the box thinking for this release to make it even more cool and befitting of The Darkness event. The event runs until the 28th of April so you still have time to check this skin out and all the other cool items at the event. Now that I’ve managed to finally get this idea out of my head it feels good to see it digitally in front of me and while a lot of times my thoughts are way more vivid than some of my skills can convey, this turned out nice enough that I am satisfied and can move on to one of the next visuals that I’ve had running around in my head recently or whatever may spring up spur of the moment when I see something outstanding that I want to feature right away. With that all said I am going to wrap this one up and leave you to browse the credits while there is one more day of weekend to freely get your shopping on.